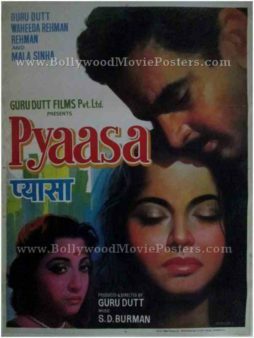 Very rare original vintage Bollywood poster of the hit Guru Dutt film, Pyaasa (1957) for sale. 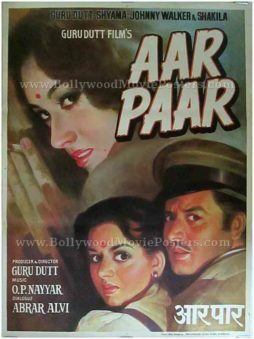 This is an actual surviving vintage Bollywood poster of the 1957 cult Hindi film that was produced and directed by one of the most influential filmmakers in Indian cinema, Guru Dutt. Pyaasa featured Guru Dutt in the lead role along with Waheeda Rehman. Pyaasa is ranked in several all-time greatest film lists and rankings, including the Time Magazine Top 100 list, making this poster highly collectible. Pyaasa has achieved cult status over the years. The film features in many top ranking lists that have been compiled over the years and is unanimously regarded as a must see film in Bollywood. Printed and circulated somewhere in the late 1960s, this old Guru Dutt poster was originally designed for publicity of the film but never ended up being used. This vintage Bollywood poster has been professionally restored by an expert paper archivist. It has been backed on cotton using a thorough acid-free conservation and restoration process and comes with a preservation guarantee. This artistic hand painted Bollywood poster features stunning portraits of Guru Dutt & Waheeda Rehman at the bottom in an iconic romantic pose. Painted by popular Bollywood poster painter Shrikant, the artwork was painted based on an iconic still photograph shot on the set of the film. Pyaasa is a 1957 Bollywood movie produced and directed by Guru Dutt. The film stars Guru Dutt in the lead role along with Mala Sinha, Waheeda Rehman and Johnny Walker. The film tells the story of a budding poet who is helped by a prostitute to get his poems published. Pyaasa was one of the closest films to Guru Dutt’s heart. Its stellar music composed by S.D. Burman was the highlight of the film. Songs like “Jaane Woh Kaise Log” and “Sar Jo Tera Chakraye” are played and fondly remembered till date. Pyaasa, like other Guru Dutt films, enjoys a cult following in France and Germany. It was a huge commercial success during its French Premiere in 1984.